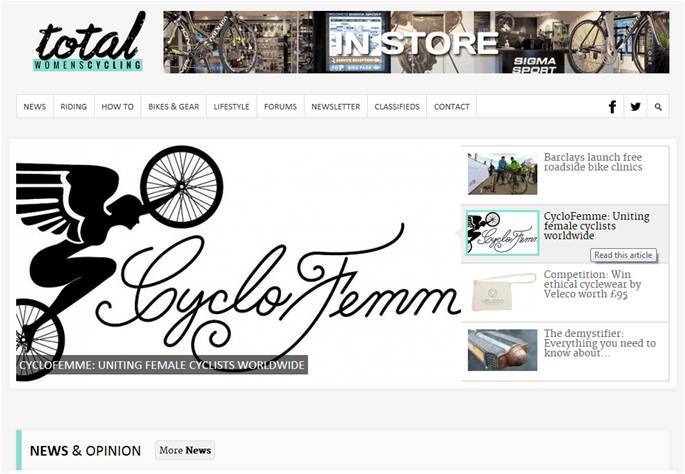 This week I thought I’d share a few other women’s websites and blogs that I visit regularly for inspiration and information about women’s cycling. I’ve even been known to republish some of their material, with permission of course. This is a fairly short list and I’m sure there are loads of other great ones. Please let me know via the comments if there are other sites you’ve come across. This is a relatively new women’s online magazine that is UK-based and launched early in 2013. It’s really hit the ground running and regularly publishes great tips, product reviews, women’s racing news and even runs regular competitions. They are also quite active on social media. Definitely worth a look. 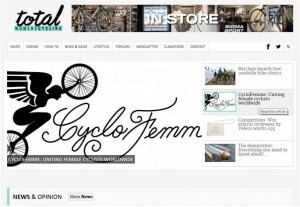 This is a Canadian site that’s an online magazine with loads of great articles about women’s cycling. It’s run by a woman called Laurel-Lea Shannon who I’ve contacted a number of times to ask her permission to republish her articles and she always agrees. The site covers issues like coaching tips, product reviews, health recipes and you can buy online training programs. This one is also a recent entry into the women’s cycling arena and claims to contain everything you need to know about cycling for women in my home town of Sydney. It contains information about tips for buying a bike, how to get kitted out, rules and etiquette and where to ride in Sydney and surrounds. Overall I think it’s a good site but I’m always curious about the authors so I think the women behind it should tell their story. It would add to their credibility and help inspire others. Pro cyclist Jo Hogan launched her own website early this year and I wrote about her and her new site. The website tells her story but also includes information about nutrition, recreational riding, stretching and coeliac disease because Jo herself was diagnosed with it at the age of 18. There is a women’s section to the Bicycle Network Victoria (the Victoria equivalent to Bicycle NSW) website that has a good list of women’s cycling articles including bike skills, nutrition, tips for buying a bike and more. For those of you who read this blog regularly you’ll know that I’m a huge fan of the women’s Specialized-lululemon team. I even bought their new kit recently. The team’s site has regular updates about racing but also profiles of each of the riders and blogs written by team members. This site is not particularly pretty. It looks like it was created in hast and the priority of its owner is to post information rather than worry about design. However, it’s got all the latest race results for the women’s professional racing so if you’re keen to keep up to date then this is the place to visit regularly. Previous Post:How to determine your optimal weight?